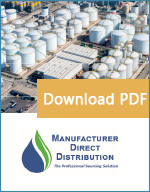 Manufacturer Direct Distribution improves your bottom line and increases efficiency by directly sourcing and delivering materials and equipment for water, power, coastal and construction projects. Directly sourced and shipped products save you money and time. In the Caribbean’s competitive environment, who has the time to search through catalogs and websites to develop new vendors. Utilize our expertise to speed up the process and keep your team on track. We are a full line distribution point for a number of product manufacturers and the Professional Sourcing Solution for every project. From capital equipment to nuts and bolts, if you need it we can source it and deliver it to your site. Scope: After 10 years in operation the main inlet header to the three cell SBR had corroded from the inside out. Due to environmental conditions and years of under‐capacity flows the corrosive gasses in the wastewater had destroyed the installed ductile iron pipe header leaving the owner no choice but to replace it completely. In the previous 2 years, the operators had used various methods of patching the pipe until capital funding could be arranged to fund the project. All materials were sourced and shipped to the site. A new 24” header was fabricated off-site, in sections, to fit with the existing equipment layout, and support structures. The header was sent to site in pieces that could be flanged or fused in place. HDPE was selected as the preferred material due to its corrosion resistance and flexibility for installation. 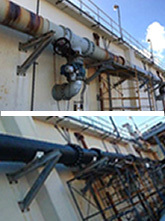 A temporary bypass was installed from the main inlet to allow the plant to operate at full capacity while the replacement header was installed. Two teams worked in tandem to remove the existing header and replace it with the new HDPE assembly. Demolition and assembly took less than three days. Once the sections were flanged and fused in place the piping was tested and the plant was returned to full automatic operation. Total time on bypass was less than 5 days. Total project duration from purchase order to completion was 12 weeks. 2 weeks for design & engineering, 8 weeks for fabrication and delivery, 2 weeks for mobilization, demolition, assembly, and testing. 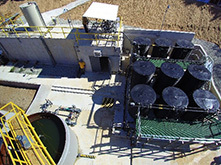 Project Scope: MD Distribution was contacted and requested to assist with sourcing of equipment for the Bordeaux Wastewater Treatment Plant on the island of St. Thomas, USVI. Working with the contractor on island and the technology provider, Fluence, MD Distribution provided 75% of the mechanical equipment and materials for the plant. When finished the plant proved that an energy efficient wastewater solution does exist and can be implemented in the Caribbean environment. Fluence’s MABR Technology along with the energy efficient equipment sourced for the project cut energy consumption at the plant site by 90% while providing irrigation quality effluent for reuse and discharge. Project Scope: After the hurricanes devastated the Caribbean islands in 2017 FEMA and the Red Cross dispatch thousands of relief workers to the region for clean up and restoration. FEMA contracted with cruise lines to provide housing for the hundreds of relief workers while on island. 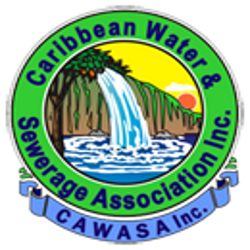 R3 Water and MD Distribution were contacted by Carnival Cruise Lines to provide a wastewater bypass to move waste to the shore for processing at the available waste treatment plants. 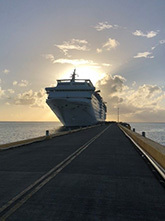 Under normal operation cruise ships do not remove waste at port in the Virgin Islands so no facilities or connections existed for that purpose. A discharge pipe was run from the bunker location of the ship to the closest available shore discharge point on the islands. In St. Croix at the Frederiksted pier the discharge pipe was over 2,000 feet long and in St. Thomas the discharge pipe was 1,400 feet from ship to the discharge point. HDPE pipe was selected for the project due to its light weight and flexibility of routing. Installation of the pipe allowed the ships to stay at port rather than going to sea in order to dump their waste tanks. This allowed the ships to serve as a base of operations for FEMA, Red Cross, and line crews operating on the islands. Prior to the pipe installation, the ships would have to sail every other day for more than 8 hours to adequately purge their tanks. During a crisis, the availability of products is always an issue. The logistics of delivering critical equipment and supplies to a disaster area can be challenging. We can provide critical equipment and supplies, utilizing our seasoned logistics network, to keep your systems operating during those challenging times.